Mix mesmerising light works with quirky museums and world-class art with our four-day Lumiere London guide. Head to Borough Market to set yourself up for the day with a tasty breakfast at Maria’s Market Café, before getting your caffeine fix at Monmouth Coffee. Spend the morning finding gourmet foodie treats at the popular food market, where you’ll discover more than 100 stalls selling everything from artisan bread to cheese (open from Monday until Saturday). Stroll to the South Bank and spot famous London sights, from Big Ben and the Houses of Parliament, to the Coca-Cola London Eye. Soak up the sights from a different perspective by whizzing down the river Thames on a speedboat – ThamesJet is giving a generous 50% off tickets with its special Lumiere London offer. After all that excitement, find a place to eat lunch by the river. Riverside dining spots with knockout views include Skylon on the first floor of the Royal Festival Hall, and OXO Tower Restaurant. Both are offering special deals during Lumiere London. Enjoy exploring the Lumiere installations around the South Bank and Waterloo, as well as across the river in Westminster and Victoria, before tucking into a nourishing late dinner. Pick from the likes of pie and mash or fish and chips, washed down with a pint of real ale at traditional pub Doggett’s Coat and Badge. Feast on a fabulous brunch at Drake & Morgan, with tasty dishes including blueberry pancakes, buttermilk chicken and waffle, and smoked salmon and scrambled eggs. Alternatively, plump for seasonal British delights at Plum + Spilt Milk. King’s Cross has a raft of small and quirky museums. Explore the colourful story of the capital’s canals at the London Canal Museum, or visit the Foundling Museum, London’s first home for abandoned babies. Literary fans can take a peek inside Charles Dickens’ former home in London at the Charles Dickens Museum, hosting the world’s largest collection of items related to the writer. The museum also has a charming cafe, where you can enjoy a light lunch of soup, quiche or a sandwich, topped off with coffee and cake. Once you've had your fill of interesting exhibits and Dickensian deliights, treat yourself to an afternoon tea with a difference at German Gymnasium. Feast on a German- or Austrian-inspired afternoon tea at the grade II listed building, featuring sandwiches, mini rolls and cakes, such as the indulgent black forest gateau and apple strudel. Take time to explore the many dazzling Lumiere installations in King's Cross, one of the key areas of this year's festival. If you're still peckish, tuck into Indian street food at Dishoom or burgers at Cut and Grind, both of which are open until late. Then, enjoy party tunes and cocktails at Drink Shop & Do, open until 2am on Friday and Saturday nights, or go clubbing at eclectic The Scala, quirky Big Chill House or Egg, a three-floor club with an outdoor lounge area. Stock up for a day's exploring in Fitzrovia with a wide-ranging breakfast at Fitzrovia's quirky Riding House Café, full of naughty-but-nice treats and tasty alternatives for the health-conscious. Explore the tiny and charming Pollocks Toy Museum, loaded with dolls’ houses, toy theatres, teddy bears and folk toys from across the globe. Also worth a look is the free-to-enter Wellcome Collection, where bizarre collections include a Peruvian mummified man and Darwin’s walking stick. Or, swing by the Grant Museum of Zoology to see a glass jar of 18 moles, alcohol-preserved brains and preserved mammal heads, along with more than 1,000 species of rare and extinct animals. Venture a short distance to Fitzrovia's bustling Charlotte Street, home to a wide range of restaurants and pubs offering cuisines from around the world. Feast on authentic Argentinian fare and enjoy a complimentary glass of Malbec (when purchasing a main meal and quoting "Lumiere London") at Gaucho, or enjoy more Lumiere London offers at fish specialist Pescatori and Peruvian-inspired Señor Ceviche. Nearby Steak & Lobster and Percy & Founders also have some tasty dining deals for Lumiere London customers. Visit Fitzrovia’s dazzling Lumiere London installations, before eating a late dinner and experiencing the nightlife scene. Eat hot dogs washed down with champagne at Bubbledogs, then treat yourself to cocktails at late-night bar Simmons; arty drinking den Bourne & Hollingsworth; cosy subterranean bar Reverend J W Simpson; or London Cocktail Club with its kitsch punk vibe. Breakfast in style in Soho: feast on a stack of pancakes at The Breakfast Club, cinnamon buns at the Nordic Bakery or eggs the way you like them at the Dean Street Townhouse. Go shopping along main drags Oxford Street, Regent Street and Bond Street, where you’ll find a rich mix of high-street shops, luxury brands and department stores, including Selfridges and John Lewis, or at cool Carnaby with its independent boutiques. Stroll over to Trafalgar Square to mosey around two of London’s major art galleries. Check out blockbuster exhibition Reflections: Van Eyck and the Pre-Raphaelites at the National Gallery, or explore Cézanne's portraits at the National Portrait Gallery. Eat a pocket-friendly lunch in a historic setting at the wonderfully atmospheric Café in the Crypt. For something more upmarket, head to the National Portrait gallery's rooftop dining spot, the Portrait Restaurant. Visit the installations in London's West End and Mayfair before grabbing dinner. Order two Mexican-Peruvian dishes at Leicester Square Kitchen and receive a free cocktail during Lumiere London (call: +44 (0)20 7666 0902, or email: reservations@leicestersquarekitchen.co.uk and quote “Lumiere Festival” to redeem) or enjoy similar Lumiere London deals at sister restaurants Monmouth Kitchen and May Fair Kitchen. 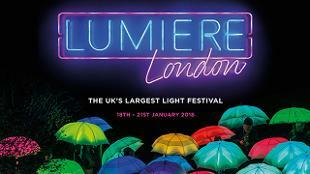 If you’re not able to make it for the whole festival, check out our one, two- and three-day Lumiere London itineraries; or follow our two-day guide for families. 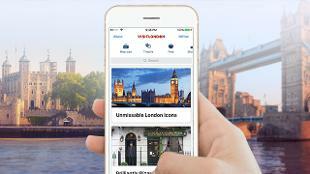 Navigate your way around by downloading the Visit London app – once you have it, plan your own itinerary. 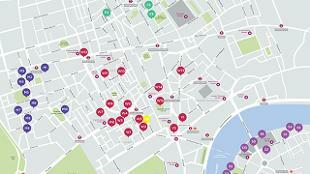 Buy a Lumiere London map to easily find all of the installations. Or purchase a souvenir guide to find out more about the festival. Make sure to also keep up-to-date with the latest transport services during the festival with Transport for London.